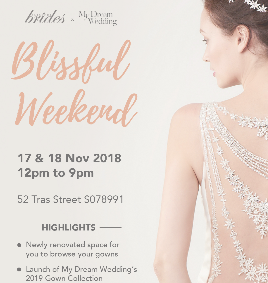 Date: 17 & 18 November 2018 Address: 52 Tras Street S078991 Highlights of the event include: Newly renovated space for you to browse your gowns Launch of My Dream Wedding's 2019 Gown Collection Try on new 2019 collection gowns for free! Join BlissfulBrides this weekend with My Dream Wedding and make a purchase to enjoy exclusive perks! 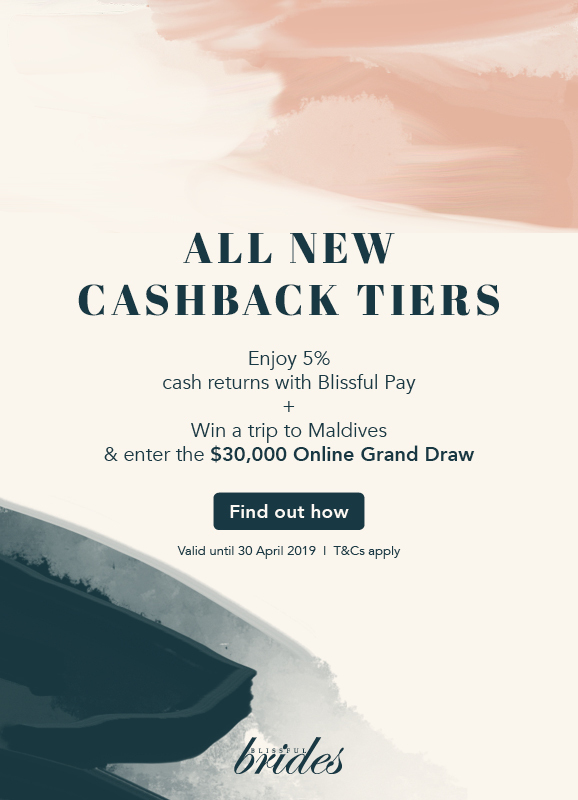 Enter Blissful Brides $20,000 Grand Draw Guaranteed cashback up to $200* Win a trip to ClubMed Kani (Worth $8,000) Date: 15 & 16 September 2018 Time: 12 - 9pm Venue: 52 Tras Street Singapore 078991 *Terms and Conditions apply. 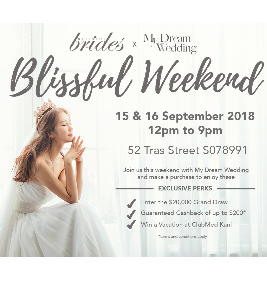 For more information, visit https://www.blissfulbrides.sg/20000 With a mission to put a smile on every bride’s face, My Dream Wedding wants to spread the love of glamorous wedding dresses, and professional pre-wedding photography. 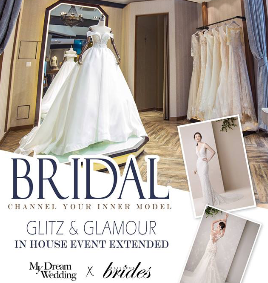 Not only do they pride themselves in their custom-made gowns but this bridal house believes that the finesse of the services My Dream Wedding provides is unrivalled. As you will see (below), being a bridal is not purely about the gowns alone, as there are other elements. In this case, My Dream Wedding’s photography skills are almost second to none. Their immaculate lighting and precision focuses on the different angles a flawy dress could give and ensures that you will remember your special day for a long long time. My Dream Wedding is inviting 20 couples to The Exquisite Bridal Sale 2018 happening on 15th September 2018. You can get your hands the best discount on complete wedding package that includes both pre-wedding and actual day items. Enjoy up to $3000 off in discount! Getting hitched in 2019? Checkout this awesome deal below! 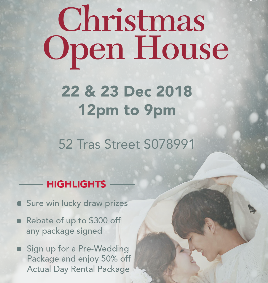 Pre Wedding Package (U.P: $2,888) 3 Outdoor Photoshoot Location 2 Bridal Gowns 1 Men’s Suits Professional Hairdo & Makeup Bridal accessories and hair veil provided Premium Photo Album Edited Soft Copies Returned RSVP Price : $2388 Actual Day Package (U.P: $2000) 1 Evening Gown 1 Wedding Gown 2 Men’s Suits Wedding Car Deco Fresh Hand Bouquet RSVP Price : $1000 How topping up just $500 to convert to a overseas pre-wedding photoshoot? My Dream Wedding will fly with you to Hong Kong / Taipei / Macau / DongGuan for your pre-wedding photobooth with extremely picturesque scenery! Enquiry more with their consultant! Limited slots available. Need more convincing? We thought so too. That’s why, when you pay My Dream Wedding a visit, it’s not just about getting flash deals, but an overall package encompassing the different elements the bridal would provide. Furthermore, the ever-helpful consultants will be there to quell your every thought. Browse through their photographers’ portfolios, and you may never know which destination might surprise you and even make you change your preconceived holiday destination. Register on the form below to reserve a slot with their friendly consultant now!